We have already featured here several tablet computers. Some are designed for the enterprise such as the Cisco Cius and the Avaya, while others are made as multi-purpose tablets like the Shogo. A unique tablet computer that is especially created for students has been recently introduced. Its name is Kno. 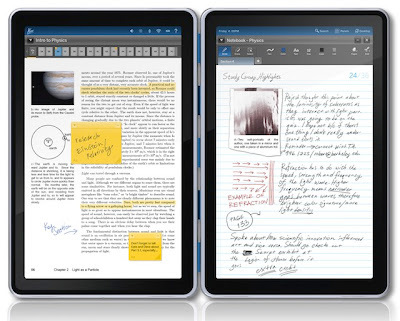 The Kno is a Linux-based tablet PC that can function as an electronic textbook, eBook reader, notebook, and web browser among others. It will be available in two form factors: the cheaper single-screen model with 14-inch touchscreen; the more expensive clamshell dual-screen model with two 14-inch touch-sensitive screens. The gigantic anti-glare touchscreen (with stylus support) of the Kno is capable of 1440 × 900 WXGA pixel resolution and can play 1080p videos. It is powered by a Nvidia Terga T200 series processor with speed of up to 1.0 GHz. For storage, it will have up to 32GB of flash memory. The Kno has a built-in 50.6-watt-hour rechargeable lithium-polymer battery that can go for around 6 hours on normal usage. For connectivity, it has an integrated Wi-Fi (IEEE 802.11 b/g) and Bluetooth 2.0 + EDR technology. The Kno's operating system is a custom Linux build and its layout engine is based on WebKit. It will support HTML5 and Adobe Flash, which is a good news for those of you who run Flash-based games or applications most of the time. 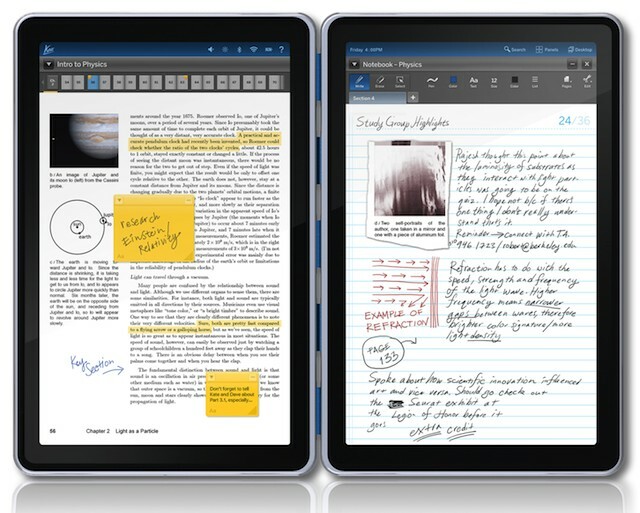 The interface of the Kno will allow users to write almost anywhere on the display and could save what they've written as notes. It will also let you drag graphics and highlighted text into notes. For backup and accessibility, data will be synced to a cloud-based server so that users can read their books or notes even when the device is not around. Out-of-the-box, the Kno will come with different productivity applications such as calculator, collaborative whiteboards, interactive flash cards, and a calendar. Using the device, you can access the Kno bookstore that contains thousands of the most popular textbooks and supplement materials. Several major textbook publishers have already participated or are expected to participate. Publishers include Cengage, McGraw Hill, Pearson, Macmillan, Bedford, Freeman & Worth and Holtzbrinck as well as BarCharts Publishing, Kaplan, Random House and a vast number of the University Presses. Initially, the Kno tablet computer is aimed at 10 college campuses across the United States but anyone can now pre-order it online. The price of the single-screen model is $599, while the dual-screen model is $899. What do you think of the Kno? Will it be good enough to someday replace our traditional textbooks? Seriously, what will it take to make a $100 tablet? TechCrunch was nearing it when Fusion Garage stole the project and now is selling the JooJoo for far more than initially planned. Its no wonder Apple is so far ahead here, they create the whole kit for cheaper than these people are able to do with a FLOSS software stack. It's sound very great! versatil and really the best way for "active study" what is the first condition for us and for our students. Additionally, the most remarkable characteristic is this tablet in comparison with others, actually is an environmental form for studying...because one have the virtual notebooks together with all textbooks. In next months when the price are decreasing I will buy a this one of these marvelous! Juan Carlos Gallego-Gómez. B.Sc., Ph.D.
Sede de Investigación Universitaria, SIU.